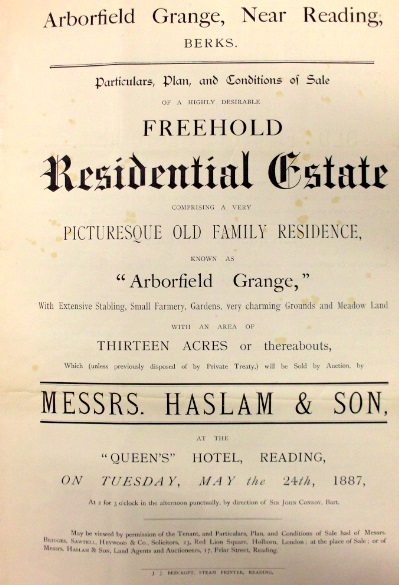 A copy of the Auction Sale document of Arborfield Grange dating from May 24th 1887 can be seen at Reading Local Studies Library along with those for 1914 and 1921 . The main pages are shown here by permission. Seated in singularly charming Grounds, and containing:- Entrance porch, outer and inner halls, corridors, principal and secondary staircases, handsome Drawing room about 33ft by 23ft inclusive of bays, Dining room about 26ft by 16ft, Morning room or Library about 17ft by 14ft, Smoking room about 16 ft by 13 ft, twelve bedrooms, store rooms, w.c.'s., housekeeper's room, servants' hall, pantry, kitchen, larder, dairy, wine and coal cellars, and other offices. Comprising saddle room, harness room, seven capital loose boxes and one stall, coach-houses, double dog kennel with enclosed yard, hay and straw stores, granary, cart shed, &c.
Adjoining good roads, but beautifully screened therefrom, near to the Church, the rectory, post and telegraph offices, &c., bounded by the Arborfield Hall Estate, and by lands the property of Sir George Russell, Bart., M. P., and Mrs. Hargreaves, and in the centre of a good hunting district. The accompanying Plan will show the position and arrangement of the buildings, grounds and lands. The very valuable Timber, the Landlord's Fixtures, Iron Hurdles, &c., will be included in the Purchase, and a right to sell the Household Furniture and other matters by Auction on the premises at any time prior to the completion of the purchase will be reserved. The entire property is now in the occupation of SURGEON-GENERAL CANNON , but possession can, if desired, be obtained by Michaelmas next.